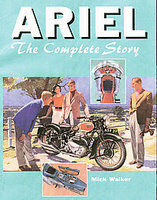 The Ariel motorcycle books cover the history, various post-war models, plus owners handbooks and manuals. Ariel Motorcycles was a British motorcycle manufacturer based in Bournbrook, Birmingham. It was one of the leading innovators in British motorcycling, and was part of the Ariel marque. The company was sold to BSA in 1944 and the name was discontinued in 1970. Ariel: The Postwar Models by Roy Bacon (1983) covers Square 4, light and heavyweight twins. The Ariel story in great detail, its model range was interesting and often exciting. Ariel Square Four Super Profile by Roy Harper (1984). The introduction of the chunky Square Four directly after the War was a revelation to the biking hungry fraternity, with its lusty power lump mounted in an up to the minute chassis. Like many fine British Bikes its life would be limited by the foreign screamers that would infiltrate our shores in the years ahead. For fifteen good years however it maintained a keen following and got further well deserved reprieve as the Healey 100/4. The Book Of The Ariel Leader And Arrow 1958-65 Motor-Cycle Care And Service Manual by William C Haycraft (1968) is a practical guide to the handling and maintenance of all 1958-64 Ariel 200 and 247cc two-stroke twins. The Book Of The Ariel: A Practical Guide For Owners Of Single-cylinder S.V., O.H.V. Touring Models (1939-1958) by William C Haycraft (1959). This handbook gives full instructions on the handling and general maintenance of all 1939-1958 single-cylinder side-valve and overhead-valve four stroke Ariel motor-cycles. It does not deal with O.H.V. four-cylinder models and vertical twins, nor with Trials and Scrambles models. 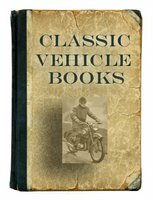 The Book Of The Ariel: A Complete Guide For Owners And Prospective Purchasers Of Ariel Motor-Cycles (1932-1939) by William C Haycraft (1942) deals with every phase of motor-cycling, including chapters on driving, legal matters, insurance, maintenance and overhauling. The Book Of The Ariel Leader And Arrow 1958-65 Motor-Cycle Care And Service Manual by William C Haycraft (1968) is a practical guide to the handling and maintenance of all 1958-65 Ariel 200 and 247cc two-stroke twins. Ariel: The Complete Story by Mick Walker (2003) profiles another of the great British motorcycle makers, in this case, Ariel. The 14 chapters deal with the different engine configurations used, military service, plus the models produced during their 60 year + existence, including the 3 machines for which Ariel were best known, namely the Square 4, Arrow and Leader. Ariel Motorcycle Owner's Handbook A Practical Guide Covering All Models From 1933 by C W Waller (1952) is a nice detailed guide for Ariel motorcycles. Ariel Motorcycles Factory Workshop Manual 1933-1951 (2007) is a faithful reproduction of the Floyd Clymer publication of the third edition (1952) of the C.W. Waller Workshop Manual for all models of Ariel motorcycles built between 1933 and 1951. Includes complete technical data, service and maintenance information and comprehensive detailed instructions for the repair and overhaul of all major and minor mechanical and electrical components, making it an invaluable resource for collectors and restorers of these classic motorcycles. There are separate sections that deal with the repair and overhaul procedures for the engine, transmission, wheels and brakes, front forks, frame and carburetor, plus a detailed electrical service section. This is a must-have reference for any Ariel enthusiast and would certainly assist in helping any potential purchaser better understand the inner workings prior purchasing of one of these classic motorcycles. Applicable To The Following Models: Four cylinder: 4/F/600cc OHC, 4/F/600cc OHV, 4/G/1,000cc OHV (Cast Iron & Light Alloy). Twin cylinder: 500cc OHV models KG & KH. Single cylinder: 600cc SV model VB. 500cc OHV models VG & VH. 350cc OHV models NH & NG. 250cc OHV models OH, OG, LG & LH. Much of the data is also applicable to later models that utilize these same engines. Publicity brochure for the Leader and the Arrow (1961) with 1960's art work, inserted price lists, road tests etc. Ariel Motorcycle Sales Brochure (1929). Ariel Motorcycle "10,000 Miles" Brochure. Quad-fold brochure features company information, press reviews, photographs and history concerning Ariel motorcycles. Brochure explains the 10,000 mile test. Motor-cycling day and night for three weeks, the test was inaugurated to prove that Ariel machines would give two years service with rear tyres as the only replacement.